Caroline came to Colorado because she loved the state and her husband grew up in a mountain town. After farming and cooking at a western Colorado B&B, Caroline moved to the local and organic restaurant Fold Community Kitchen in Carbondale and then to Acorn, a Denver restaurant emphasizing wood-fired fare and small plates. Her dedication to sustainable sourcing of vegetables, dairy and meat led her to seek out chefs who shared her passion. Caroline defines sustainable sourcing as supporting local food sources year-round and buying not just what’s popular, but what’s in season. Chefs can contribute to their local "food-shed” by planning their menus locally and seasonally. Caroline likes to cook as though she is hosting a dinner party at her house, and that intimate feel permeates her restaurant, Annette. She oversees every plate that comes out of her kitchen, and her identity and tastes are evident in every dish. Caroline is planning vegetable gardens behind the restaurant to grow food for the restaurant . She works with a local fish distributor, often using bycatch rather than insisting on a single species of fish. She sources her cheese, eggs and meat from distributors and local farms and ranches that raise their animals carefully and ethically. Caroline cooks scratch to table, over a wood fired grill, serving food that honors the seasons, supports ethical farmers, and nourishes customers. 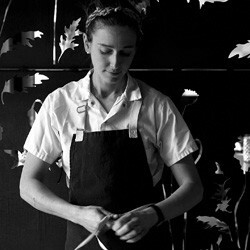 Annette, under Chef Caroline Glover, embodies craftsmanship, creativity and rustic simplicity.